As I complete my 16th semester at Iowa State University, I can’t help but reflect at the simple power of bringing good people together. Last December, Iowa Staters Joe (’86 agricultural business) and Karen Kerns kindly opened their beautiful home in rural Boone to host Agricultural Entrepreneurship Initiative students, alumni, supporters and others involved in the agricultural entrepreneurship community for a holiday party. It was a delightful time for fellowship, idea sharing and making new friends. ‘Ecosystem’ is used in many ways, but I think it is an appropriate term to use for the community that is being built by the Kerns and those like them who engage the Agricultural Entrepreneurship Initiative. Each year we ask for help from so many great friends for mentoring, interviews, panelist duty and other ways of engaging with students and others on campus. Now that ecosystem is sprouting new vines off-campus in a number of ways including the market-changing businesses launched by past and current students engaged in the initiative. A survey of ISU alumni conducted in 2008 showed that 20 percent of College of Agriculture and Life Sciences (CALS) graduates from 1982 to 2006 had started a business, averaging 12 employees per business. I fully expect the next generation of ISU CALS graduates to have an even bigger impact. In 2016, we helped launch the Ag Startup Engine, a program in the ISU Research Park to identify and fund innovative agricultural startups. Because of our rich network of entrepreneurs and agribusiness leaders, the launch of this business startup program is a very natural and significant progression of our support of agricultural entrepreneurs. Entrepreneurial places and industries have a cultural element that sets them apart. There’s a vibe, an energy and a dynamic that supports and encourages entrepreneurial behaviors. That entrepreneurial culture is expressed now in the agricultural startup community by support for aspiring agricultural entrepreneurs and an action-orientation among industry professionals and organizations for championing new ideas. That action is making an impact and is important to the future of agriculture and Iowa. Analysis from the Kauffman Foundation shows that 80 percent of net job creation in the United States since the 1970s results from new businesses. If we imagine a more dynamic future for agriculture and Iowa, startups must be a part of it. We have alumni who’ve been out of school for a few years now working on their first startup. We have current students partnering with past students on new businesses. And we continue to have so much help from seasoned business professionals and entrepreneurs in creating new opportunities. The network of great people who support the Agricultural Entrepreneurship Initiative is an expression of the vibrancy of the agricultural startup community and represents the evolution of a dynamic agricultural startup ecosystem. 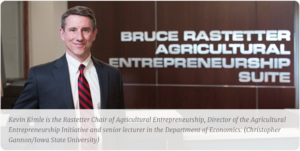 Read the full article at https://stories.cals.iastate.edu/2017/06/agricultural-startup-ecosystem/.